How do I rent the Gene Daniel Community Center? Call Joyce Shaw at 330-658-2181 ext. 1120 for information and availability. Also look under the Parks and Recreation page for more information. 1. How do I rent a Pavilion in the park? 2. How do I rent the Gene Daniel Community Center? 3. What is the Summer Recreation Program? This program is offered to children who live in the village or township who are ages 6 -13. The program runs beginning early June through the middle of July. It is on Monday, Wednesday and Friday from 10 am 12 noon. Sign ups are held at Village Hall several dates in May. More information is sent out through the schools around May 1st. Registration for Village residents is $30 per child and $25 per each additional sibling. For non-Village residents the fee is $40 per child and $25 per each additional sibling. Cash and checks are accepted. 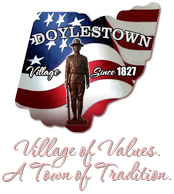 Checks are to be made payable to the Village of Doylestown.